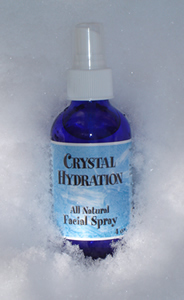 Crystal Hydration - All Natural Facial Spray - Experience Younger Looking Skin by Hydrating Dry Skin Conditions. With the most luxurious facial spray from the purest crystal spring water. High in the Rocky Mountains winter comes early and lasts long. under the top layer and reach down into the cold lake. can no longer produce the spray until the next winter season. Use as a facial spray although your entire body will appreciate it. Let air dry after spraying. I just want to say that we have literally found the best water ever! Order now, fresh from this winter's crystal harvest. We are a Paypal secure and authorized reseller.